After an energy loaded 48 hours of sessions MENA ICT Forum ends an engaging event that that included everything telecom expansion to online Arabic content that we think if you didn’t attend, definitely need to know about. The MENA ICT Forum is actually a direct decendant of the Jordan ICT Forum which held biennially the last of which being in the year 2006. The attempt to create an event gathering the regional players of the ICT industry in Jordan doesn’t come without it’s challenges. One main challenge was namely how to get the serious players to actively participate in the forum hopefully providing a space where conversation could actually lead to tangible results. Or so we hope to see in the near future. Ushering the audience into the event was no other than Werner Vogels, VP & CTO of Amazon.com, which was an obvious message the organizers sent to observers of the level they expect the outcome of the event to be in. Followed by Stanislas de Bentzmann Co-Founder & Co-CEO of Devoteam everyone knew exactly what to expect, but surprises still managed to work their way into the program. The event kicked off with an interesting session on Multi National Corporations (MNC) sharing experiences learned in the region with a panel dominated by enterprise IT players of the like of Naseem Tuffaha of Microsoft and regional startup rockstar Ahmed Nasseef VP & Managing Director of Yahoo! Middle East (aka Maktoob.com). Just as everyone was easing into the ambiance of the event word came in that HM King Abdullah of Jordan arrived to give everyone a helpful word of advice and a push in the right direction, encouraging ‘asking the tough questions and challenging the status quo’. After his majesty’s supportive visit which also included some emotional video compilations and short allegiant speeches the forum was back in full throttle with possibly it’s most engaging and interesting session on Entrepreneurship & Start-ups. Moderated by the dynamic Wajih Halawa this was the MENA rockstar panel including Yamli‘s Habib Haddad and MeydanJo’s Maher Kaddoura, this group truly provided insight to how things are and should be in the MENA entrepreneurial landscape. After Laith Al-Qasem Chief of Party of the USAID Funded Jordan Economic Development Program, Habib Haddad took over the mic explaining how the startup game works for companies targeting the region. “An entrepreneur is someone you throw off a cliff and will be able to find the right tools to fly with before he/she hits the ground” said Habib after being asked what kind of faces entrepreneurs face in the region. He went on saying “in MENA instead of providing Entrepreneurs with tools, we basically just push them off the cliff” in a call for a better entrepreneurial ecosystem to be implemented by MENA investment funds and individuals. Refusing the common blame shifting tactic others so easily rely on to explain the region’s immature startups scene Kaddoura head of a explained it’s the private sector not the regulators who need to take initiative: “We need to perform while we transform, in our community we do not believe in the institution”. “We need to encourage business people in investing, it doesn’t have to be $200,000 or a million, start with $5000 and see how things go from there” added Kaddoura pointing out the popular misconception amongst investors that they need to spend a lot to get a result out of a startup. You can find more details about this panel’s discussion on TNW’s Live Blog post here. The rest of the day discussed Education & Cloud computing each in it’s own session with the education panel lacking a teacher and a realistic perspective on how to make things better. It was as if the the more mic a panelist received, the less discussions held value. The Cloud Computing panels on the other hand were quite interesting, delving into the distinctions between Private and Public clouds and tackling issues like where we should draw the line between the two, and how privacy is is maintained in the different models. 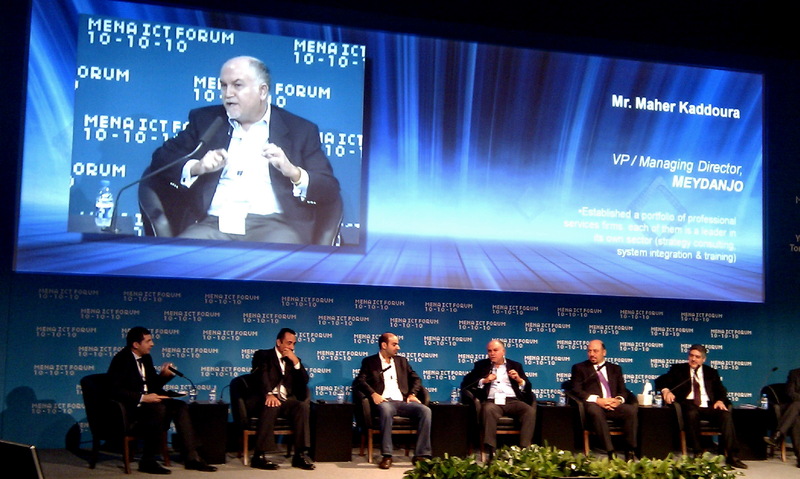 In one instance the discussion took an interesting turn where some of the panelists called on future events to include a statesman to explain the government’s opinion on whether embracing Cloud based services was a matter of governmental regulation, or simply that of government body heads instead. The response came faster than expected with an impressive leap on stage from the audience floor by H.E. Marwan Juma Minister of IT and Communication in Jordan. Juma explained that although acceptance of IT is mostly widespread within governmental ranks, the shift to cloud services has yet to prove itself in the face of skepticism with issues like security proving to be bureaucracy’s most effective excuse, or the only valid reason for not to. Setting the tone for the next, day 1 of MENA ICT Forum was as engaging as it was hopeful showing that the region is heading in the right direction, but could definitely use some guidance.